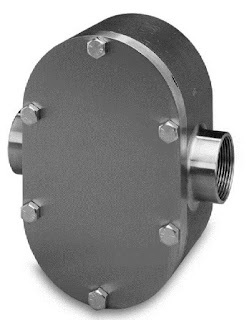 Unlike other liquid flow measurement technologies that rely on the measurement of a physical property of flowing media to produce a volumetric or mass flow measurement, a positive displacement flowmeter provides a direct indication of actual volumetric flow rate. There are a number of different positive displacement flowmeter designs in use throughout industrial, commercial, and even residential installations. Positive displacement flowmeters can be applied to liquid or gaseous media, with the selection of the mechanical internals being a significant factor in the suitability of a design for a particular application. Rotating gear flowmeters are especially well suited for high viscosity liquids. As the fluid drives the gear assembly, liquid is trapped in the spaces between the gear lobes and the housing. The rotation of the gear moves the liquid from the inlet port to the outlet. The product datasheet provided below has a good illustration of the geared positive displacement flowmeter operating principle. In many cases, a positive displacement flowmeter appears similar to a positive displacement pump, with the primary difference being that the pump is provided with its own motive power (a motor) and the flowmeter is driven by the process fluid. Positive displacement flowmeter gear type for high viscosity liquids from Hile Controls of Alabama, Inc.